← New release: Must Love Ghosts! Whew. The first week of September is always so busy for us. Two birthdays. Back to school. Apartment move in. A video shoot. And somehow, in all of this, I still managed to publish the last episode of the Coffee & Ghosts serial. Read more about that here. I also managed to send out a brand new story into the world, along with another to a reprint market. But now? Now it’s time to go bake a red velvet birthday cake. 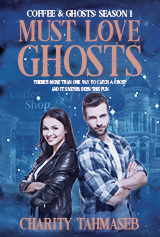 The final episode in the Coffee & Ghosts series, Must Love Ghosts is out this week. Read more about it in my post from earlier today.